Rosie's grandfather is very ill and she and her family travel from the United States to London to say goodbye. On her first night there she witnesses a brutal mugging. She feels something strange and all of a sudden time has been put back a few minutes and someone prevents the violent mugging from happening. Rosie wonders what she's seen and if it's real. She finds out more when the same thing is about to happen to her. She's intrigued by the guy who rescues her. His name is Albert and Rosie knows he'll be able to answer questions about her grandfather. Albert has a special ability, something that's badly needed as a group of aggressive guys are attacking people both randomly and organized. Rosie is one of their targets, but she doesn't know why. She's doing everything she can to keep her brother safe, but he's made friends with the wrong people. Two of the muggers are trying to make him one of them. Will Rosie and Albert be able to prevent more tragedy from happening to Rosie's family? Rosie's holiday in London isn't a happy one. First her grandfather passes away, then her boyfriend breaks up with her and her brother is in trouble. She's strong and determined to do everything she can to make things better. I liked that about her. Albert and his friends have interesting abilities and they're both caring and tough. The main characters are all interesting. I couldn't wait to find out more about the secrets Rosie's grandfather managed to keep from his family. Slowly Rosie's learning more about him and also about herself. 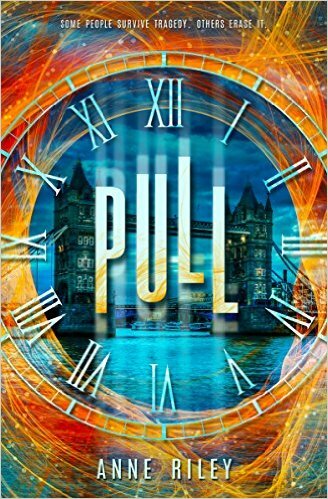 Pull has a spectacular finale and a sweet ending. It's an amazing story with a lot of action. There's an influx of criminal activity and Albert and his friends are trying to find out why. Pull is a book about a handy supernatural power that saves a lot of lives. There's a battle between good and evil. There are a lot of bad guys, but not that many good ones who can deal with them. The good guys have to be smart and they have to work hard, because people with their ability are rare. The idea of the abilities and the battle Rosie and Albert are fighting is great and the execution is really good. I liked this wonderful story very much. I may get this to read for a different genre.